This statement was originally published on smex.org on 26 September 2017. The Facebook page "Where is the state? 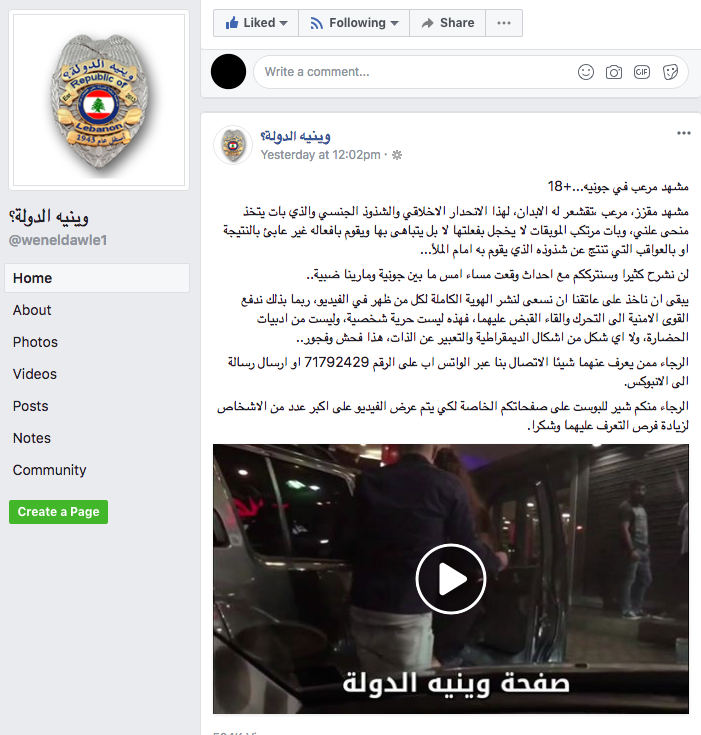 (وينية الدولة؟)," which has over 250,000 likes, regularly posts high-quality videos or pictures documenting alleged crimes in Lebanon, garnering hundreds of thousands of views. While Facebook suspended the page on Tuesday, September 26, 2017, because it posted personally identifiable information about two individuals, its backup page, which has almost 70,000 followers, remains active. The mission of the page is to crowdsource detective work in order to catch the perpetrators of these alleged crimes, a practice known as online sleuthing. People view the videos or photos and attempt to identify the suspects, sending information to the page through its inbox or via WhatsApp. This information often consists of names, addresses, and other personally identifiable information. Sometimes, this information is shared publicly via the page, presumably to let the followers of the page know the results of their work. Sharing this information breaches these alleged criminals' right to privacy and endangers their access to justice in the process. Beyond breaching the right to privacy, this page helps foster an unhealthy vigilante culture in Lebanon and raises questions about its relationship to the state. A recent video displaying an encounter between a man and a woman clearly illustrates this issue. On Sunday, September 24, the page published a video of a woman leading a man around the Jounieh area, north of Beirut, on a leash, which gained over 500,000 views. Along with the video, the page stated "it remains to be taken on our shoulders to seek to spread the complete identity of all who appear in this video, perhaps thereby compelling the security forces to move and arrest them." Just a few hours later, the page published a second post claiming that the Internal Security Forces (ISF) had arrested the man in the video, and named him publicly. The page also named the woman in the post and revealed that she identifies as transgender, potentially subjecting her to harassment and violence. Then, on Monday, the page announced that the Internal Security Forces had arrested the woman as well; it posted detailed information about both individuals, including their ages, places of work, and brief descriptions of their life. Releasing this information violates the right to privacy under Article 14 of the Lebanese constitution and under Article 12 of the United Nations Declaration of Human Rights, which Lebanon has adopted. Ali Mourad, an assistant professor of public law at Beirut Arab University, wrote in a Facebook post, that publishing pictures and information about these people "eliminates the basic principle of presumption of innocence" and promotes the "defamation" of these two individuals. Thus, they are less likely to receive a fair trial and they could be detained without being formally charged. Moreover, the decision to publish information about these individuals places them in danger. Mr. Mourad emphasizes that this page is particularly dangerous because it not only violates the right to privacy, but it also aims to transform "every citizen … into an inspector, a judge or an informant." The administrators of the page encourage Lebanese citizens to provide information about innocent individuals and publish it indiscriminately. In this case, the page shared extremely detailed information about the arrests of both people, claiming it had received it from its followers. Even the post about the arrest contained more personally identifiable information about the individuals than ISF's Facebook post regarding the incident. Some people are asking whether the authorities, instead of intervening to protect people and their personally identifiable information, are actually helping and supporting this page. In his Facebook post, Mr. Mourad mentioned that "public administrations interact often and positively with this page." One activist, who wished to remain anonymous, posited that both the quality and quantity of the videos on this page suggest that the ISF run the page, or at the very least are in contact with the person who does. Vigilante culture is dangerous on its own, but it becomes even more dangerous if it is possibly receiving tacit support from the authorities. As a digital rights organization, we ask the Facebook page administrators to seek the support of proper channels to investigate crimes. Posting individuals' personally identifiable information threatens the safety and well-being of presumably innocent individuals. More importantly, we urge the Lebanese state to protect the privacy rights of its citizens and those residing on Lebanese soil; this entails creating stronger data protection laws to ensure third party actors cannot release personally identifiable information about people without any repercussion.